We have a few common design themes that run through our work. The appearance of natural wood elements evokes a warmth and rustic character associated with West Coast cabins, You’ll see lots of Western Red Cedar in our work, Exposed beams, often along with subtle hints of Maple, Oak and Walnut to provide an eye catching contrast, yet maintain the authentic, natural feel. In harmony with the West Coast style, we make use of Scandinavian design themes, which embrace minimalist, uncluttered spaces. Clean lines and light colours help to maximize the feel of the space.We use lots of natural light to open up the space. 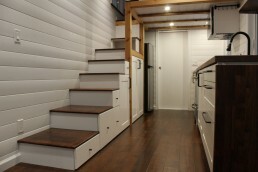 We are big on beauty, simplicity and functionality in all of our tiny home designs. The whole point is minimalism, not to cram as much as possible into the space. 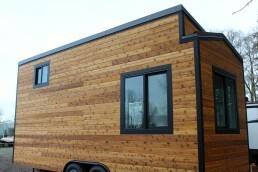 We think carefully about how the tiny home looks, both inside and out, in our designs. We strive to create a tiny home that you are proud to show off to your friends, and really showcase what it can offer to those who are skeptics. We are dedicated to giving our clients the best service possible, we regularly go above and beyond to find you a tiny home that fits you perfectly. We understand that everyone is different, and each their own personal needs, and we make it our mission to find out exactly what it is that is important to you. 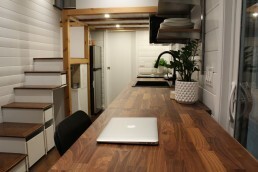 How can we beat other tiny home companies in service? We are not an assembly line or factory pumping out tiny home after tiny home, you won’t get lost in a constant stream of mass production. We focus on creating a smaller number of tiny homes so that we can do them really well. We can dedicate more of our time to making sure you get your ideal home. We never lose sight of the fact that Tiny Homes are much more than commodities. It’s not just sending you a Tiny Home, we are delivering you a lifestyle, Your Tiny Home is an extension of your personality. We actually don’t work with just anyone. Since we focus on a smaller volume of Tiny Homes, we have the luxury to work with clients that we really feel are a good fit with our values and personalities. We love working with people that have a vision, really care about quality and are practical minded. Don’t be scared to pick up the phone and call about anything, there are no hard sells here, we are happy to share any knowledge or info that we can. It is imperative that we have a conversation before we can even think about working together. We want to understand who you are, what’s important to you, why you want a tiny home and what you like and don’t like. If you have a scribbled freehand sketch, you are far ahead of most – we want to see it! From here, if it looks like we both can be a good fit for eachother, then we will move to the design stage. There are many ways to get in touch, you can reach us through our contact form or ‘get an estimate‘ feature. You can also reserve a tiny home phone call where we can chat about the work we do, how the process works and ask us some questions. Book a 20 minute phone call with Kevin, the owner, to talk about tiny homes and break down how it all works. 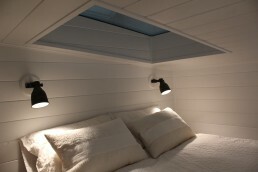 We would love to hear all your ideas for your tiny home. Also a great opportunity to ask any questions that come to mind and get a feel for what working with us is like. After this, you will have lots to think about. Take some time, gather as much information as possible, talk to lots of Tiny Home Builders and try to find the most suitable one for your needs. If it turns out that it is us, great! If not, thats ok, we are still more than happy to help you figure things out if we can. If your Tiny Home project does look like a good fit and you are ready to move ahead with your build, we will book you in to a specific time slot within the year depending on availability. From Build start date you can expect your Tiny Home to be finished within 3 months and Tiny shells within 4 – 6 weeks. We will finalize all designs and cover all the details of the tiny home, before build starts so that there is no delays for the build. Once the build starts we will send you regular updates and photos to let you know exactly how your build is progressing. Once we finish the Tiny Home in all of its shiny glory, we can deliver it to you or you are welcome to come and pick it up yourself. Our service doesn’t end here, We like to keep in touch to make sure you are happy with your tiny home and everything is working as it should. We are available 7 days a week, so if there ever is an issue with your tiny home please get in touch.